LEGO always has a strong presence at San Diego Comic-Con, with fans lining up in the early hours of each morning to win a chance at buying exclusives. This year, they brought out LEGO Marvel Super Heroes 2 to show off plenty of characters you’ll have the opportunity to build with later this year and a classic Avengers threat. Kang’s opportunity to shine (er, conquer). The panelists fawned over Kang, arguing that he’s likely the Avengers’ best villain. To most of the general public, he’s not very well known, so taking this opportunity to showcase Kang excited the teams over at Marvel and Telltale. Much of the story and Kang opportunities were pulled from Avengers Forever and Kang Dynasty story lines, as penned by panelist Kurt Busiek. His love of Kang and a general respect for his stories was very evident during the panel. The Marvel Universe is pulled together via Kang’s desires. In its rich history, Marvel has has plenty of beloved characters. But something has been different about the last several years in particular. They’ve been able to introduce new characters that immediately resonated with the fans. Spider-Gwen, Kamala Khan (Miss Marvel), and Miles Morales’ Spider-Man are among the forefront of current universe. With Kang opening up pathways to different dimensions, it’s giving characters the opportunity to interact with each other in ways not typically seen. They’ll be from well known locations such as Attillan, 2099, Wakanda, Manhattan (current and Noir), and K’un-L’un. Character crazy – as usual. Character unlocks are a staple of LEGO games and Super Heroes 2 looks to be introducing one fine new batch. Most interestingly, TT Games is debuting an original character: Carnom. In an experiment gone wrong, Venom and Carnage have fused together to form Carnom. That’s likely to make a lot of ‘90s kids very, very happy. Beyond Carnom and the aforementioned trio of Spider-Gwen, Spider-Man, and Miss Marvel, we’ll see over 200 characters, including: classic Doc Ock, Throg, Gwenpool (who will have her own side quests for you), Howard the Duck, Iron Duck, Spider-Man Homecoming’s Vulture, Smashtroll, Cosmo, and Forbush Man. The developers have gone so deep as to include Forbush Man. 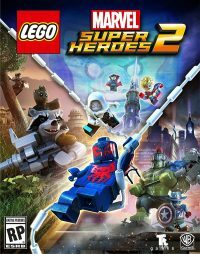 LEGO Marvel Super Heroes 2 releases November 14, 2017 for the Xbox One, PlayStation 4, Nintendo Switch, and PC. You can check out our impressions from E3 here.